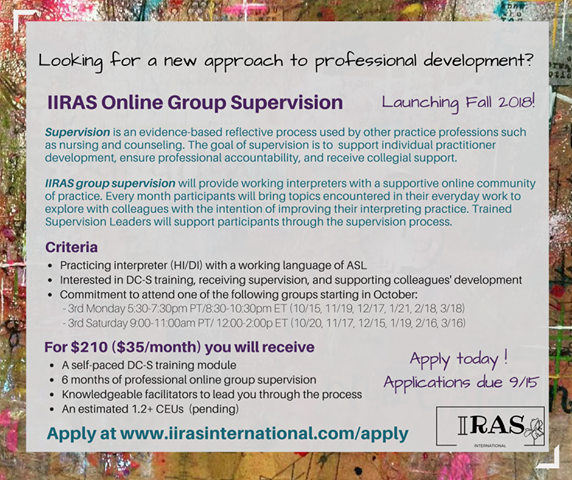 This information will help IIRAS select individuals to participate in a 6 month long online professional supervision program. This application should take 10-15 minutes to complete. The sign-up period closes 9/15. As spaces are limited for this opportunity, we will let you know shortly after if you have been selected to participate. Participant: Individuals who are interested in receiving professional supervision to improve the quality of their interpreting work and who wish to support their colleagues in their professional growth. Participants will benefit from a basic knowledge of the demand control schema. However, we will be providing a self-paced DC-S training module to orient us all as we begin to apply the DC-S framework in our sessions. Participants will select one of the following options for supervision sessions the entirety of their 6-month commitment.